Everyone always asks me for my “Pumpkin Bread” recipe. The truth is, the recipe is just average – there is nothing special about the recipe itself. Any oil-based pumpkin bread recipe will yield approximately the same results. So why does my “Pumpkin Bread” always receive such rave reviews? Secret #1 lies in the type of “pumpkin.” Instead of regular American sugar pumpkin (or the nasty orange slime from a can) – I use the Japanese winter squash called Kabocha. “Oh, well, that’s just great,” you might be mumbling to yourself, “Where am I supposed to get that??? ?” Pretty much any Asian grocery store will have it. I’ve also seen it, for a slightly higher price, at health food stores (like Whole Foods, Henry’s, Sprouts, etc. ), and sometimes even at the local supermarket chain. Secret # 2 involves allowing the Kabocha to mature after harvest (or in my case, picking it up from the market). Usually, I will leave a Kabocha on the kitchen counter top for at least a month before roasting it. This step helps to develop the flavor of the kabocha, and enhances the sweetness. But you don’t really have to wait this long… most of the grocery store Kabochas have probably been sitting around for awhile anyway. Be careful when cutting open a Kabocha – it’s really hard and very tough to cut through. Use your sharpest, biggest knife, and proceed with caution. 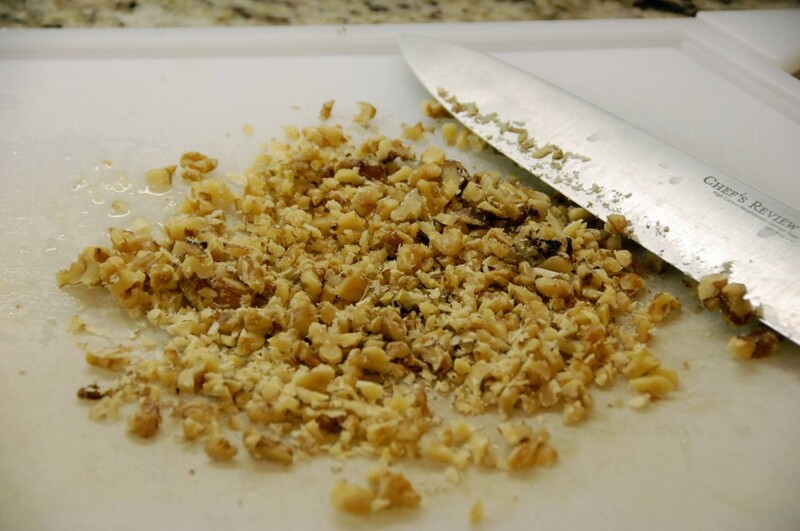 Cut it in half, vertically, then scoop out the seeds from the inside. 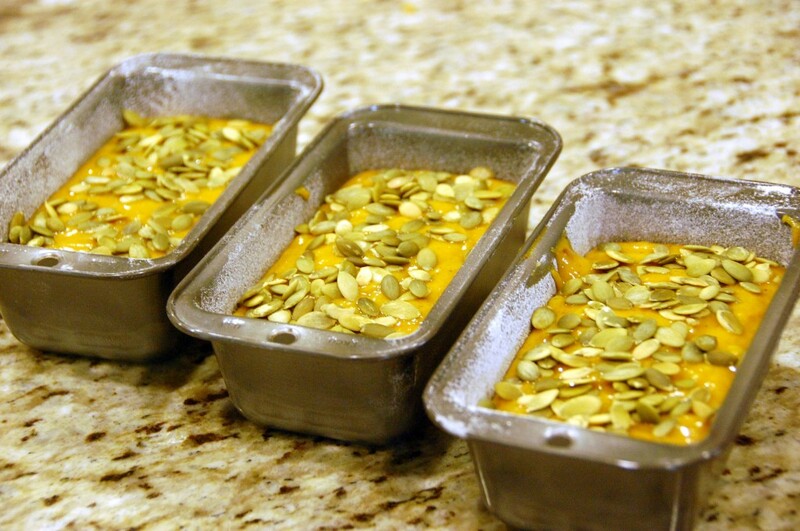 Bake the kabocha halves for 1 hour in a 350 degree oven, (cut side down) on a baking sheet lined with foil. Let it cool for several hours before scooping the pulp into a plastic storage container. An averaged sized kabocha will give you enough pulp to make this recipe 2-3 times. If you have extra kabocha, you can put it in a Ziploc freezer bag, squeezing out all the air, and freeze for several months until you want to make it again. 1. Preheat your oven to 350 degrees F (175 degrees C, or 448 K). 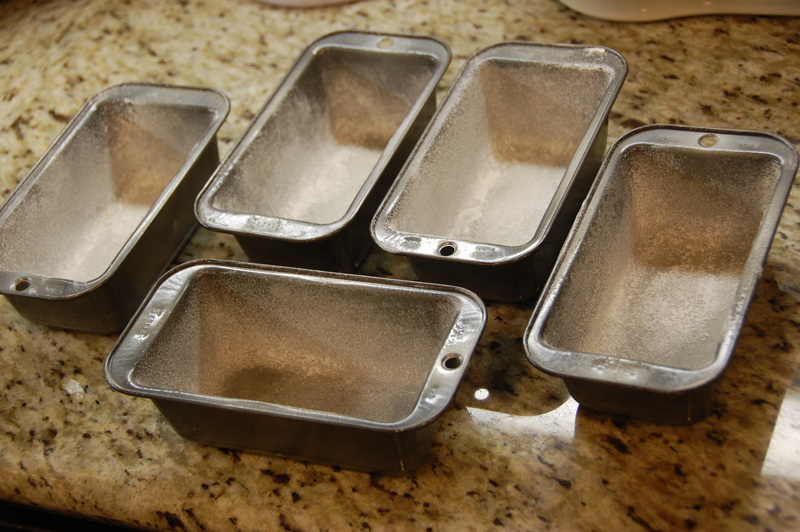 Grease 5 mini-loaf pans (or 2 regular sized loaf pans) with butter (or non stick spray), then dust with flour. 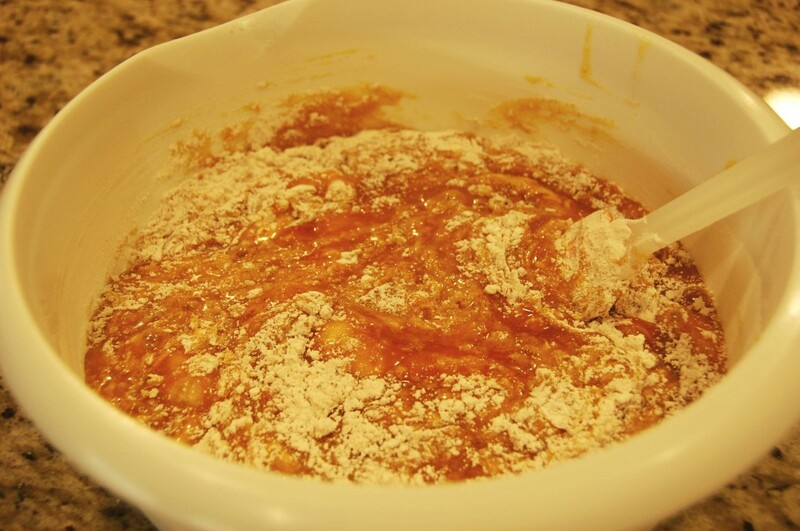 (The flour will help keep the pumpkin bread from sticking to the pan after baking.) To do this just dump a few tablespoons of flour into a greased pan, tap it all around until the sides, corners, and bottoms of the pan are covered with a thin layer of flour. Shake the excess flour into the next pan and continue. As a final step, I liked to hold each pan upside-down over the sink and tap the bottom a few times to remove any extra flour. 2. 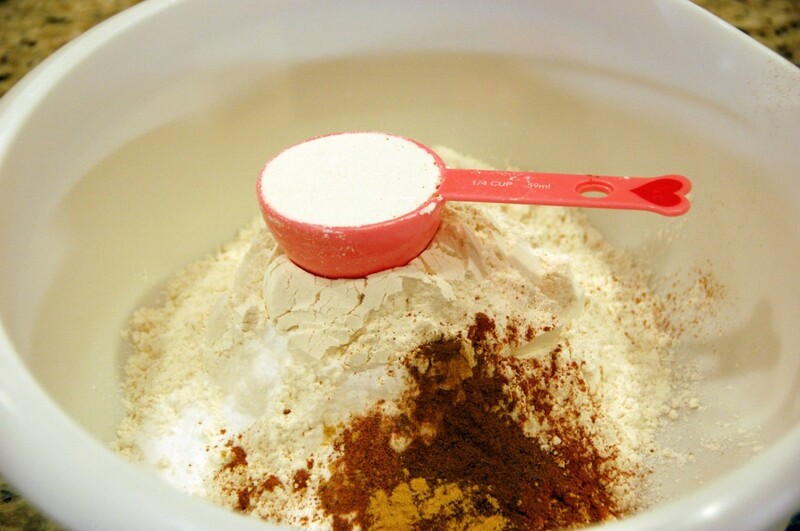 Measure all your dry ingredients (flour, baking soda, salt, and spices) into a large bowl. Make sure you stir your flour first to “lighten” it, and when measuring, use a straight spatula (or the blunt end of a knife) to level it off. Sift all the dry ingredients together, using a whisk. Please don’t skip the sifting step! 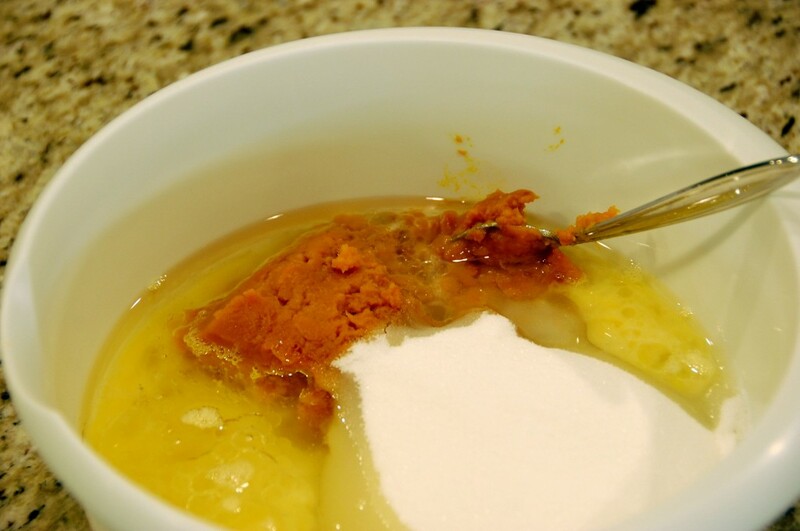 If you leave little clumps of baking soda, someone will end up with a nasty-tasting surprise in their slice of pumpkin bread. Yuck. Baking soda does not taste good! 3. Mix together the kabocha, eggs, oil, water, and sugar until you have a uniform orange mixture. 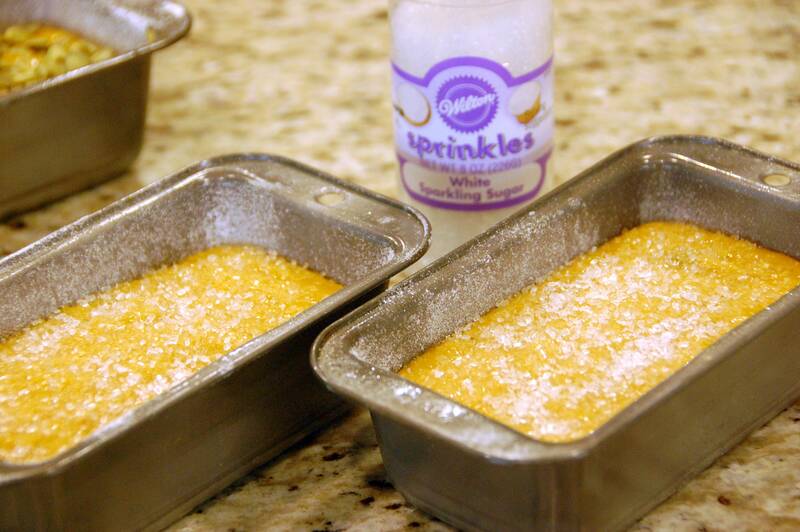 Sprinkle the tops of the batter with large crystal decorating sugar like Wilton Sprinkles. If you don’t have decorating sugar, you can just sprinkle plain old granulated sugar on top. I prefer the larger crystals of the decorating sugar – it makes the final product look a little nicer, but regular sugar will do in a pinch. Alternately, you can decorate the tops with raw pepitas. Pepitas are shelled pumpkin seeds, and you can find them in the bulk grain/spice section of a health food store. I have also found pepitas in the “international” aisle of the regular supermarket, with all the Mexican spices (packaged in little plastic bags, hanging from hooks) and dried chili peppers for like $1. You can also skip the decorating step and just leave the tops of the batter plain. I like to add a little crunch on the top – it makes the loaves look more appealing to the eyes. 7. Bake the mini-loaves at 350 degrees for approximately 45 minutes. If baking 2 larger loaves, then bake for 50-60 minutes. Muffins will take about 20-22 minutes. Don’t forget to do the touch test to make sure the loaves are done: gently press the top of the bread with your clean finger, and if it gently springs back (without feeling too soft or mushy), then it is done. When done, cool in the pan on a wire rack for 5 minutes. Run a rubber or silicone spatula around the edges and flip out the loaves onto the cooling rack. When the loaves are completely cool to the touch, wrap with waxed paper and an outer layer of plastic wrap. This will keep for a little over a week in the refrigerator. Or you can wrap each loaf in several more layers of plastic, and freeze for up to 3 months. You can leave it out on the counter if you finish the pumpkin bread within a few days – just make sure it stays tightly wrapped in plastic to keep it from drying out. I discovered the benefits of the kabocha-for-pumpkin substitution one day by accident… I was craving Pumpkin Bread, but to my dismay, didn’t have any pumpkin! (Plus, I’m lazy, and didn’t feel like driving to the market.) However, I did have a Kabocha sitting on the counter, staring at me. “Why not?” I thought, “It’s not that different.” I mean, I’ve heard of people making “pumpkin pies” with cooked carrots instead… and kabocha and sugar pumpkin are both squashes… The end result was pure serendipity. Since then, there has also been Kabocha pie, Kabocha cookies, Kabocha soup… you get the idea. Well, I guess that means my dark green secret is out of the bag. 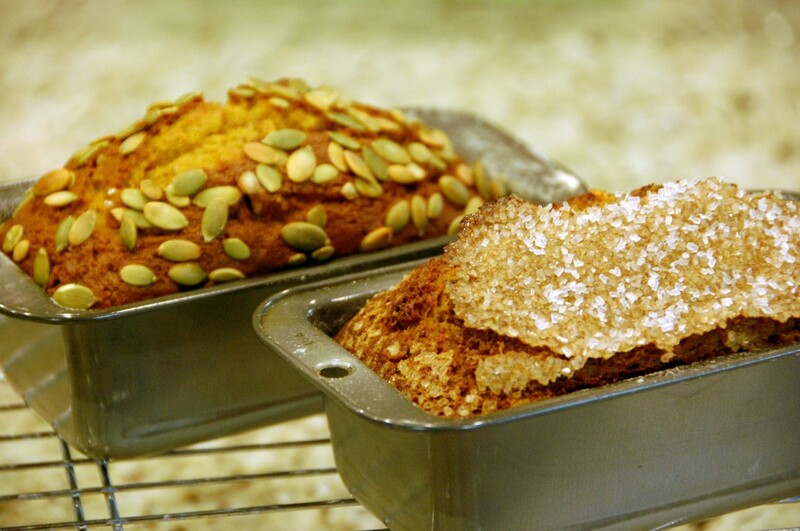 I hope my confession inspires you to try kabocha next time you make pumpkin bread! This recipe is great. Everyone that I shared the bread with loved it! 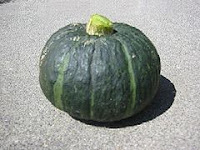 To the author of the blog: are there any other kabocha recipes you would recommend? I love the way this pumpkin tastes, but so far I only know how to make nimono kabocha and kabocha bread. One huge pumpkin can last all week in my house, so I need new ideas! Hi Mira! 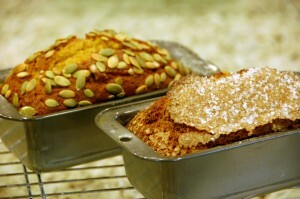 I’m glad you liked my Kabocha Pumpkin Bread recipe. 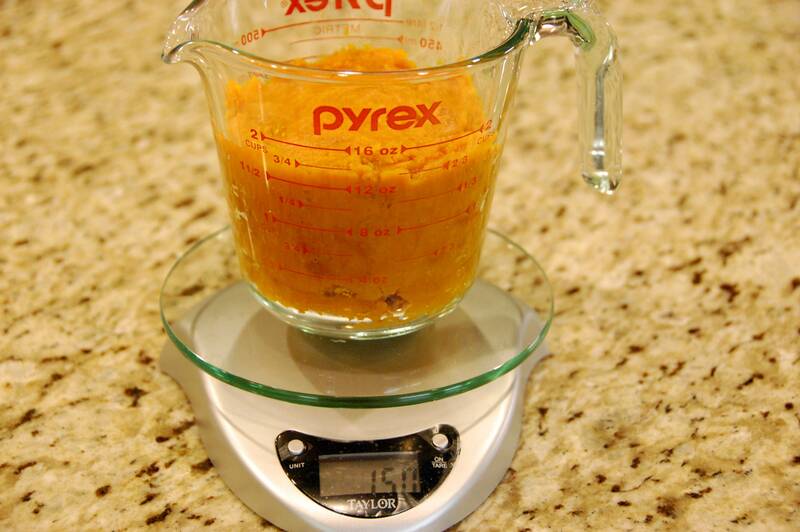 You can use kabocha just as you would pumpkin… maybe try making a pumpkin pie with kabocha puree? You might even try something savory like pumpkin soup, or deep fried kabocha slices (tempura style). You can mix mashed kabocha with mashed potato, then cover with breadcrumbs and fry – making little potato/kabocha patties too! Hope this helps.